One of the very first things I bought from Beachbody in 2008 was the P90X Pull Up Bar. Here it is 2018 and I still have it. And I am still using it. Its one of the few pieces of equipment I frequently use in my home gym. Not once have I ever thought about selling in garage sales we’ve had or putting it on Craigslist. It is too valuable of a piece of workout equipment to give away too. Unsurprisingly I bought the P90X Pull Up Bar to do P90X with back in the day. After doing many rounds of P90X, Body Beast, The Asylum, a handful of other Beachbody workouts, and for when I just feel like doing some pull ups, the P90X Pull Up Bar has shown its durability. Rarely has a month gone by when I don’t use it at least once and when I’m going full tilt with a program you know its included. Pull ups and chin ups are too valuable of an exercise to not do. 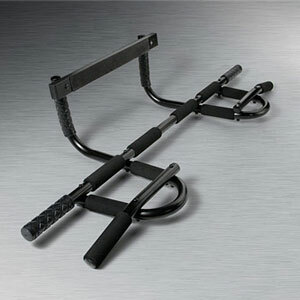 The P90X Pull Up Bar is made from heavy gauge steel. Beachbody claims it will hold up to 300 pounds of weight at one time. I am not 300 pounds so I cannot confirm this statement. What I can say is after doing thousands of pull ups and chin ups over the past decade the steel has not bent at all. Doing all of the different pull ups and chin ups over the years has been easy to do with the patented 10 grip handle design. Wide grip, close grip, reverse grip, staggered grip, and others are easy to do. It does come with rubber handles to protect the molding from getting damaged but I recommend putting a rag or thin towel between them and the molding as it may leave marks on the paint. The P90X Pull Up Bar is quick and easy to assemble. You do not need to nail the P90X Pull Up Bar into the wall either as it stays in place. It takes just seconds to remove when not in use. Be sure to measure a couple of doors first as the P90X Pull Up Bar fits doorways up to 32 inches wide. I’ve lived in bungalows the past decade and for some funny reason I have one doorway where I can put it. Mostly it’s because I don’t want to mark up the moldings on a door frame that’s visible. Our last house was the bathroom. And now its my sons closet. Always something with bungalows. You’re in luck. I made a YouTube video showing off the many uses of the P90X Pull Up Bar and me trying not to make a fool of myself doing pull ups and chin ups. If you want to crank out more pull ups or chin ups than attach the P90X Chin Up Max to the pull up bar. One caveat about the chin up max is over time the bands might break and Beachbody does not sell replacements. After five years of owning it this happened to me. I recommend keeping all three bands on when using the chin up max and going for more reps instead of taking a band off. All or nothing with that piece of equipment. It can help a lot doing other Beachbody workouts like Body Beast, The Asylum, and more. Sometimes you need a boost to get those extra reps. 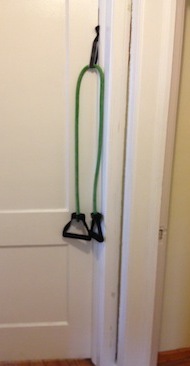 If the P90X Pull Up Bar will not fit in your doorway or you do not have the money then I would recommend you buy the resistance band upgrade kit. 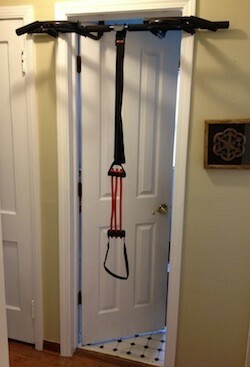 It wraps around your door hinge and you loop a resistance band through it. Going this route will save you some money and help you build up strength. This is a great alternative for people who know that there is no way they will be doing pull ups anytime soon. At $60 the P90X Pull Up Bar is not cheap. And I think that’s a good thing. Why would you want a cheap pull up bar. I’m going on a decade of ownership and it’s just as good as it was when I bought it new. Its worth the money. Yes, you could probably find a cheaper pull up bar on Amazon or some place else but I think you’d be better off spending the extra money on something that’s going to last.